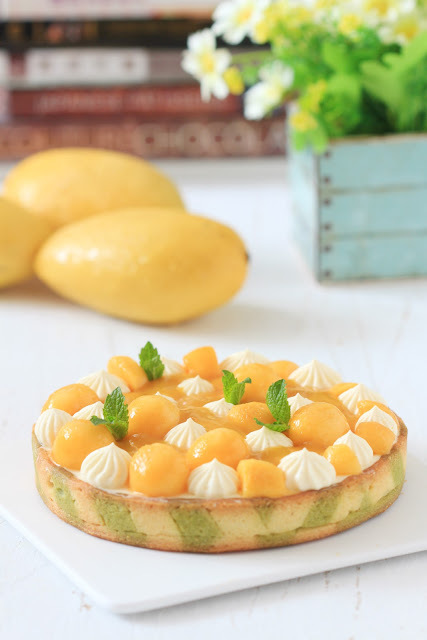 my bare cupboard: Mango cream tart "
Filling is just a simple diplomat cream, a lightened pastry cream mixed with whipped cream. A versatile pastry filling and frosting. * In a small bowl, stir together sugar and pectin, set aside. * In a small saucepan, bring the purée into the boil. Add in the pectin-sugar mixture and let boil over medium heat for 2-3 minutes, stirring from time to time, add in lime juice. Transfer in a small heat-proof container, let cool then chill in the fridge until needed. * Make this a day ahead. * Soak gelatin for 5-10 minutes until softened; squeeze off excess water. * Bring the milk, vanilla, and half of the sugar into a boil. 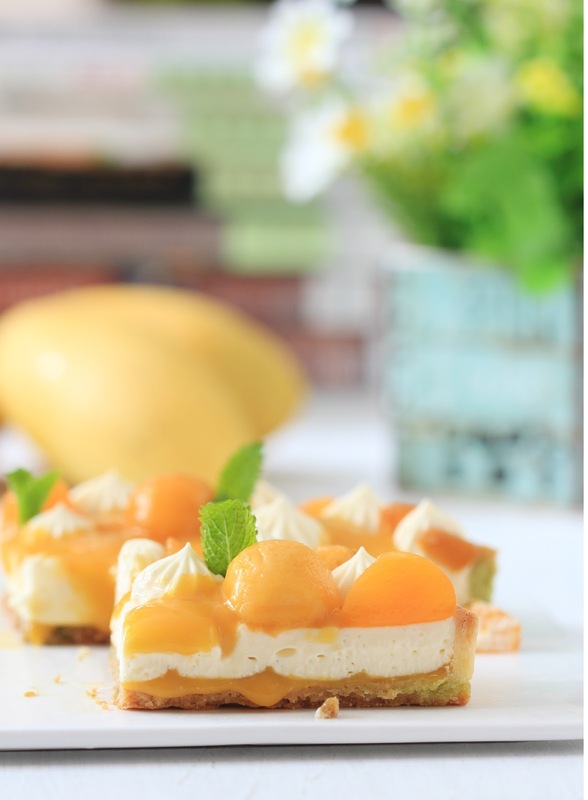 * In a small mixing bowl, whisk together yolks and the remaining sugar until creamy. Add in the cornstarch and whisk until smooth. 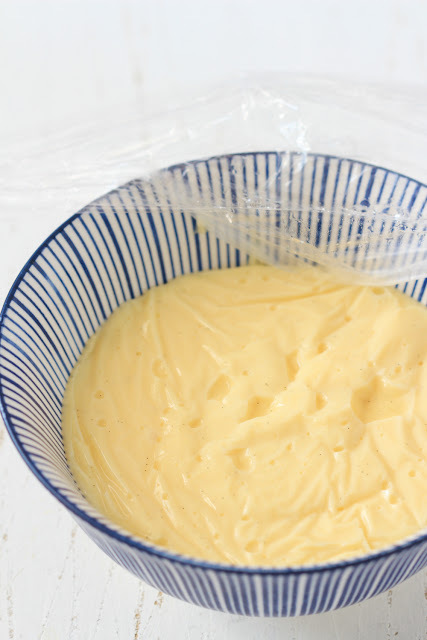 * Gradually pour in warm milk into the yolk mixture, whisking as you pour to prevent curdling. Pour back the mixture into the saucepan and bring to the boil while whisking constantly. Let cream boil over medium heat for 2 minutes until thick. Remove pan from heat; add in the butter and stir until well combined. Add in the softened gelatine and mix until completely melted. * Transfer in a shallow container or a bowl, place a plastic wrap on top of the cream. Let cool then chill in the fridge until needed. * You can make this few hours or overnight before using. * Beat cream until stiff peaks form, chill in the fridge until needed. * Stir or beat pastry cream until smooth. Fold in whipped cream in 2 additions until well combined. 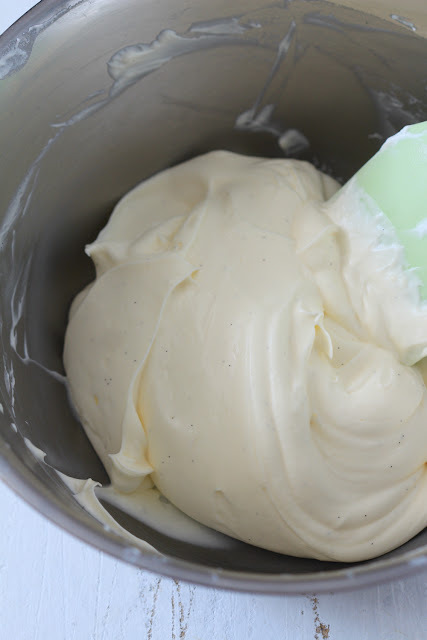 Using a beater/handmixer, beat diplomat cream over low speed for 30-45 seconds until smooth. Chill in the fridge until needed. * In a mixing bowl or a clean work surface, mix together the butter, sugar, almonds, the 2 flours and the salt. Rub ingredients together until it forms a fine breadcrumbs, add in the egg and mix until it forms a shaggy dough. Gather dough together and knead gently, 4-6 times, until smooth. Place in a plastic wrap and form into a 5-inch square. Chill in the fridge for at least 3 hours or overnight. 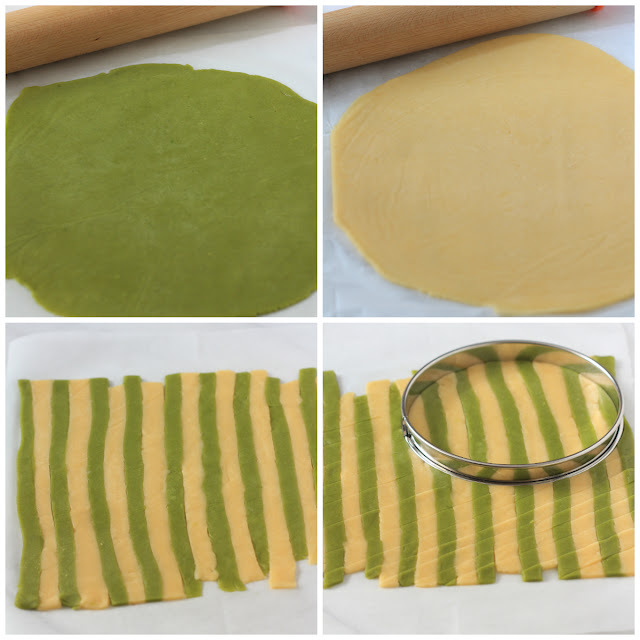 * Roll out the dough separately (duh) into 2 mm thick, using sharp knife or a pizza cutter, cut a long strips to about 8-10 inch in length and 1/2-inch wide (rough guesstimate). Carefully lift out each strip of dough and place it alternately in a baking sheet lined with parchment paper. If the dough gets too soft to handle, freeze for about 10-15 minutes or until it's firm yet pliable. 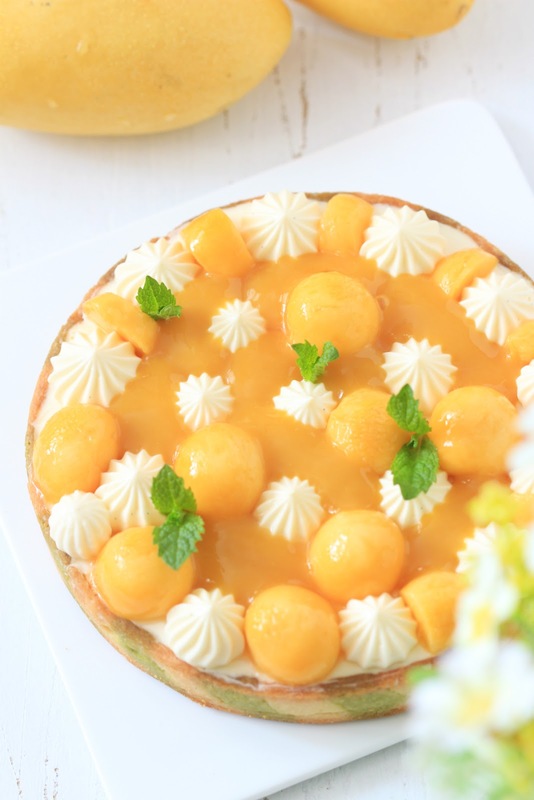 * Grease a 6-inch tart ring and use it to cut the bottom base, cut strips of dough about 2/3-inch thick to line the sides. Remove the unused dough strips and save it for later use. Freeze for 1 hour before baking. * Preheat oven to 180ºC. Press parchment paper against the crust, fill with pie weights and blind bake for 15 minutes. Take out from the oven and remove the weights and bake for another 10 minutes until crust is golden brown. 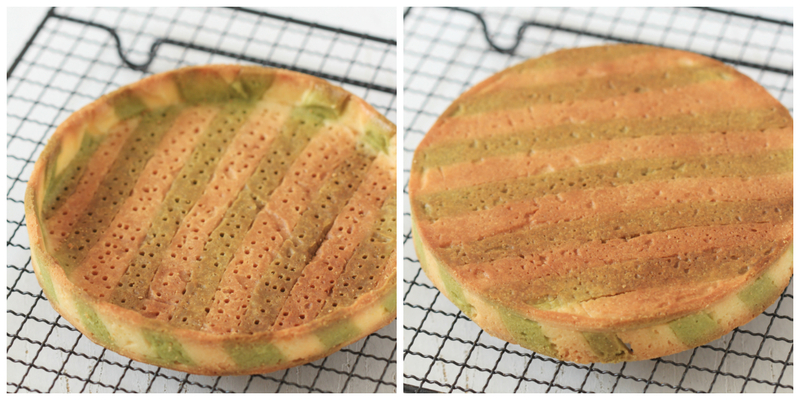 Let tart cool in the ring over a wire rack before removing it. * Spread 55 grams of mango sauce at the base of the crust and pipe in some diplomat cream over it, smoothing the top. Chill the remaining diplomat cream for decoration. Chill for at least 4 hours or overnight. * Stir diplomat cream until smooth, place it in a piping bag with a small star tip, pipe randomly according to preference. 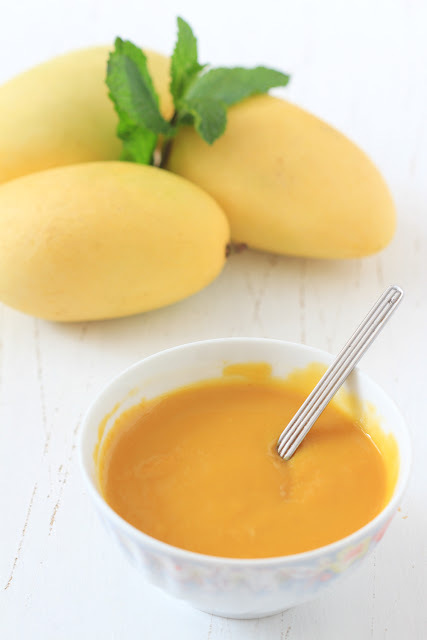 Add in some round and cubed mangoes and add in some compote. Chill for at least 30 minutes before serving. Decorate with some mint leaves. 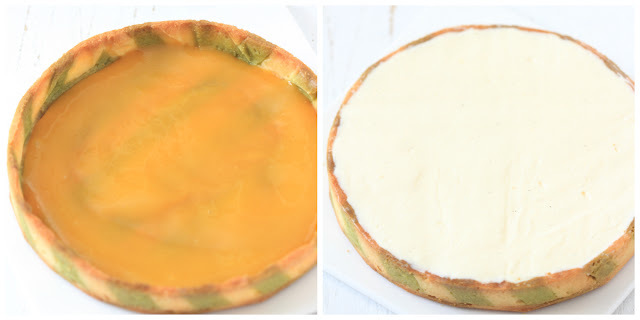 * Store leftover tart in an airtight container and place in the fridge. Consume within 3 days.